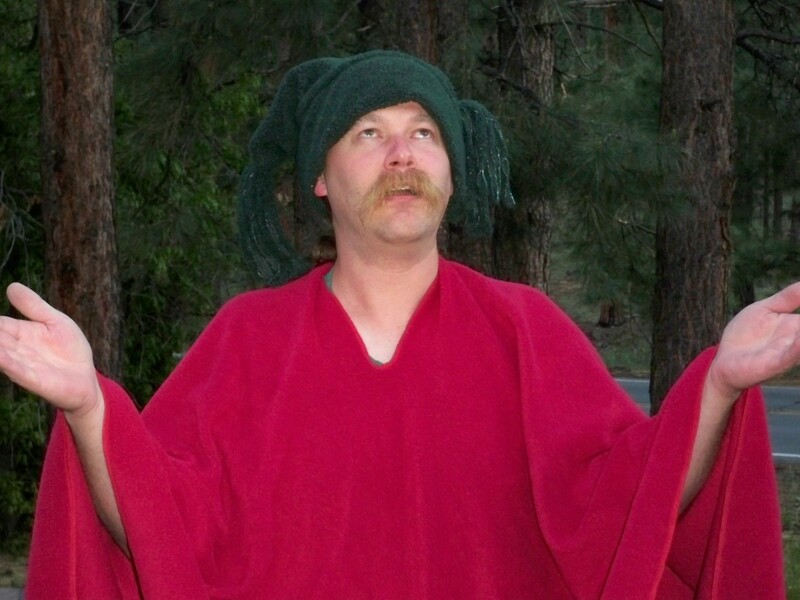 If you peek into my closet and go through my drawers, you'll see a LOT of fleece -- pullovers and pants, fleece socks, fleece mittens and hats, fleece scarves, and even a homemade, red fleece serape (pictured here). I have a big pile of fleece PJs, and if I could find fleece underpants and bras, I'd wear those too. Did I mention I have a thing for fleece? And Steve here is a big fan of fleece himself. In fact, he even offered to model for us. What a sport! 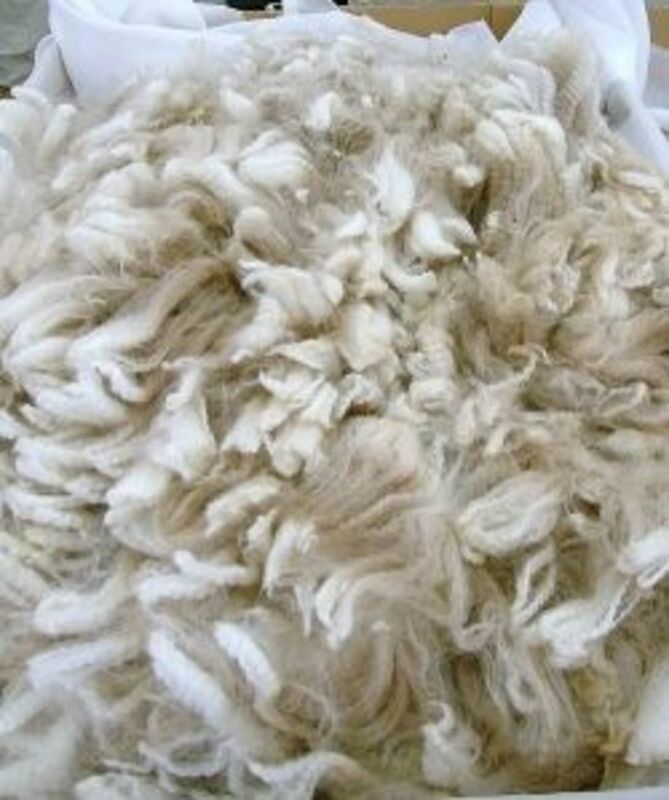 Fleece in its natural form is the wool you get when you sheer a sheep or similar animal. Here, however, I'm referring to fleece material, which generally has a combed or brushed nap, making it soft and airy. Wool fleece absorbs moisture and can be heavy, while synthetic materials are lighter and wick moisture, making them more suitable for strenuous activity. 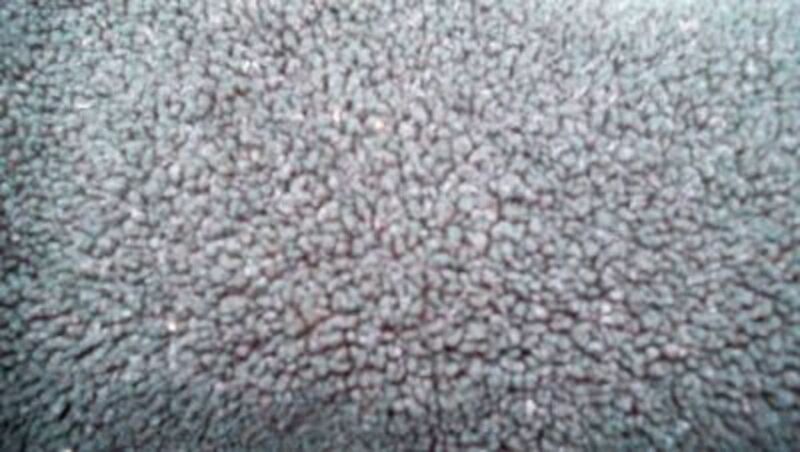 Polyester fleece, a two-sided pile material, is often used for sweaters, sweatshirts, jackets, mittens, hats and blankets. It's moisture-resistant, dries quickly and doesn't pill up with extended use. This type of synthetic fleece became popular for use in outdoor clothing in the early 90s, when hikers found it to be lighter and warmer than wool. It's even been used in deep-sea diving suits and to make underwear for astronauts. Fleeces are often referred to by weight. Microfiber fleeces are very popular for athletic apparel, because they provide the warmth of much thicker fleeces without being bulky. They’re also very light. 100-weight fleeces are slightly heavier than Microfleece. 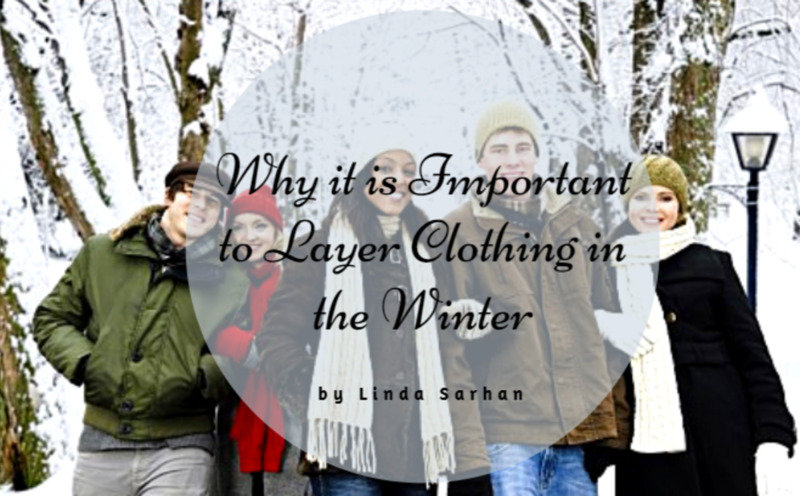 They’re often used as a first layer or lightweight sweater, as well as for hats and gloves. Medium-weight, or 200-weight, fleece is the most popular on the market due to the added warmth it provides without much additional bulk. A 200 fleece is good for all seasons and is often used for jackets, vests and blankets. The 300-weight fleece is great for very cold outdoor activities, worn as an insulating layer by itself or under a waterproof shell. Work it, Steve! Work it! 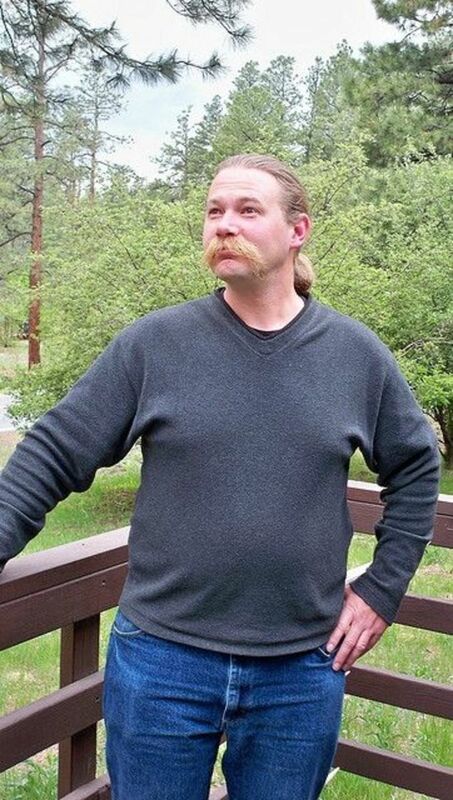 Here, the mustached one models his charcoal-gray fleece pullover sweatshirt (available in many different colors). Steve--a hiker, artist and machinist--isn't easy on his clothing, but this much-worn, 5-year-old piece of fashion finery is as good as ... well, okay, not new, but it's got years of life left in it. Below, you'll find fleece for your top, your bottom, and your whole body, for day or for night. Fleece pullovers come in v-neck, crewneck, zip-neck and occasionally turtleneck styles. Steve and I wear them all the time just as we would sweatshirts or sweaters. This wind-resistant., 100% polyester, no-pill fleece pullover comes in 5 colors and 6 sizes. It features a half-zip front, a stand-up collar, and elastic cuffs for a snug fit. See the Amazon listing for the price range, depending on size and color selection. A full-zippered jacket is great for layering during outdoor activities, over a synthetic tee and under a down vest, or a nylon or Gortex shell. This 100% polyester jacket made of 420g MTR fleece is available in 15 colors and six sizes. It features zip closed pockets and an interior drawcord. See Amazon for the current sale prices on certain colors. Steve and I both carry a pair of fleece pants on our backpacking trips. They're great to pull over lightweight pants, tights or shorts while hanging around camp. I often put them on over my shorts when leaving the gym on chilly days and for lazy lounging around the house. These pants are made of 92% Polyester fleece and 8% Spandex, so they're machine washable and can be tumble dried. The have flat seam construction for the greatest comfort and a tighter fit for no bulk layering. I have fleece PJs, but not footie fleece PJs. Oh, husband! I would like to request these for Christmas, please! This one-piece, non-shrink polyester fleece pajama is made for both men and women, with vinyl-padded non-skid soles, buttons in front and a Velcro "trap door" flap in back. It comes in size Small (110-155 lbs., 5'2"), Medium (135-180 lbs., 5'4"), Large (160-210 lbs., 5'7") and X-Large (175-235lbs., 5'9"). Steve, let's go! We'll come back here to the fleece costumes when we're finished looking at footie PJ's. 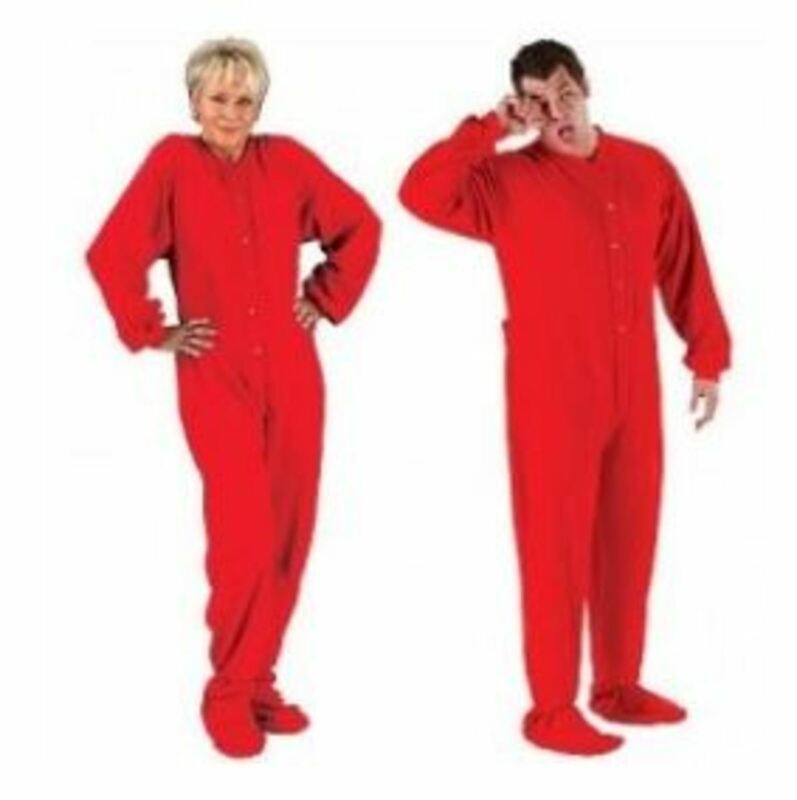 These are micro-fleece footed pajamas for men and women, with button-down fronts and padded non-slip feet. And, yes, they have rear trap doors too. You know, when the doorbell rings just as you're getting out of the tub or while in the process of air-drying. Enjoy spa-like comfort in this soft, warm lounging piece. There's also a nice plush microfiber bathrobe for the men. This comfortable getup, perfect for monkey business, includes a jumpsuit with the attached plush headpiece. Now, do they make these for adults too? And who needs to wait for Halloween to wear this cute suit? "My son wore this Curious George costume on Halloween. It was comfortable, complete and adorable. He received tons of compliments from friends, family and strangers. I loved that he could wear normal, comfortable clothes underneath and it had hands and feet, but my son was still able to use his hands and feet easily. The headpiece was attached so he could wear it or leave it down and we didn't need to worry about losing it." Darn, it doesn't look like this comes in my size. This fleece Curious George costume is available in child sizes only: Toddler, Small, and Medium. Keep the kids warm while trick-or-treating or strolling around town on Halloween -- or for fun any time it's cold -- in these soft fleece costumes. And there are even some for the grown-ups and his-and-her couple costumes too. 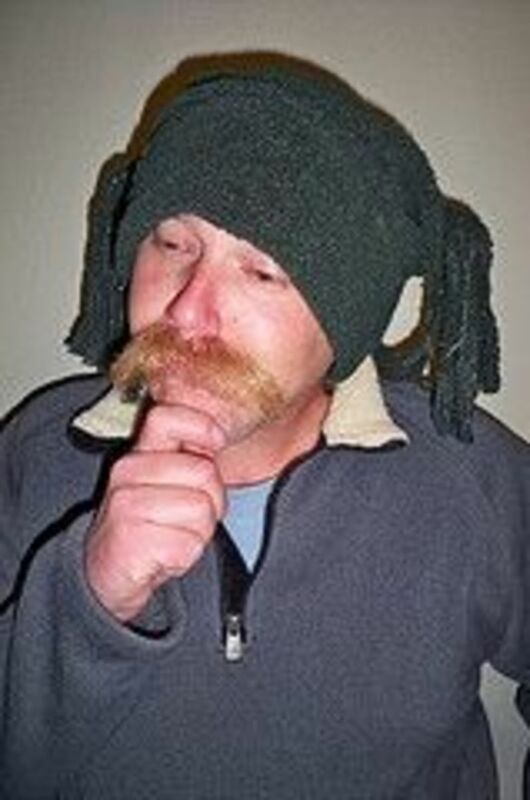 This fleece headwarmer was made by a good friend of ours from the fashion mecca of Confluence, Pennsylvania. 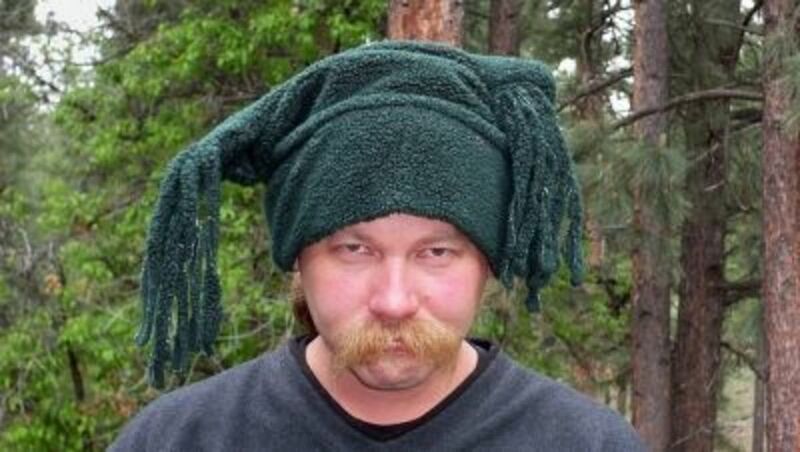 It's a one-of-a-kind, I'm afraid, but there are lots more fun fleece hats to be found. This hat comes in five different colors and is long enough to not only cover your head but also protects your cute little ears. I use my headband a lot. It's a great happy medium between a full head covering and no hat at all. And if my head still gets cold, I can just throw a hat or ball cap right over the top. Too warm, and I can pull the headband down around my neck. 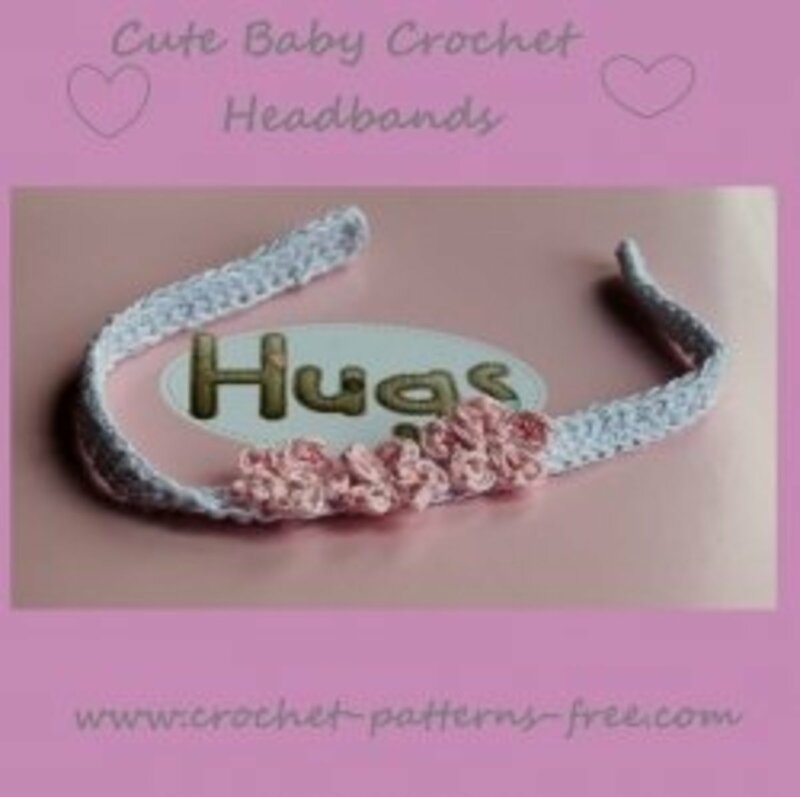 This headband comes in a dozen different colors and is constructed with 95% polyester and 5% spandex fleece. 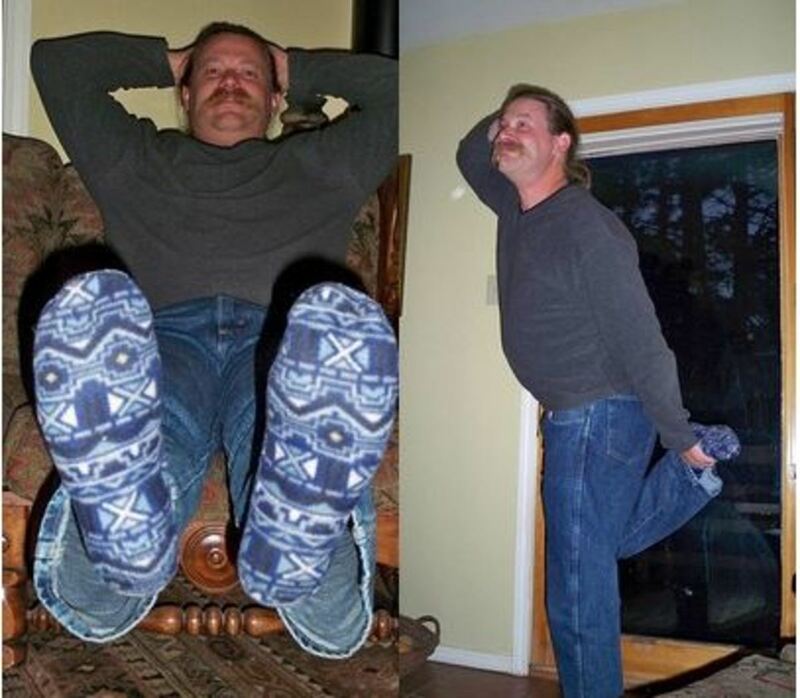 Fleece For Your Feet - Steve wants to show you his fuzzy socks. Very nice, dear. This micro-fleece sock, for men and women, is lightweight, soft and warm and wicks moisture to prevent odor. These socks are available in 28 colors and prints. See the Amazon listing for great sale prices on certain color and print selections. The only problem is, it's sometimes difficult to get people out of it. We make a fleece layer cake out of our bed: fleece fitted sheet, fleece top sheet, fleece blankets and fleece pillowcases. Within that fleece cocoon in my fleece jammies and fleece socks, icicles could be forming inside the house and I probably wouldn't know it. Sleeping Steve in his fleece socks and ... well, in his fleece socks ... probably wouldn't notice, either. Say goodbye to the Oo! factor when you climb into bed on those chilly winter nights and say, "Aahhh," instead. These lightweight, machine wash and dry sets made of 100% polyester fleece come in five different colors and include flat and fitted sheets, and 2 pillowcases. They're available in twin, full, queen and king. See the Amazon listing for the current sale price. Glomitts are made of Arctic Fleece with Thinsulate insulation and come in assorted colors and sizes. I guess I finally have to wash those socks. Ugh. Definitely a nice thing to have when it's real cold and windy. Here's the Sassy one in her favorite burgundy fleece blanky. 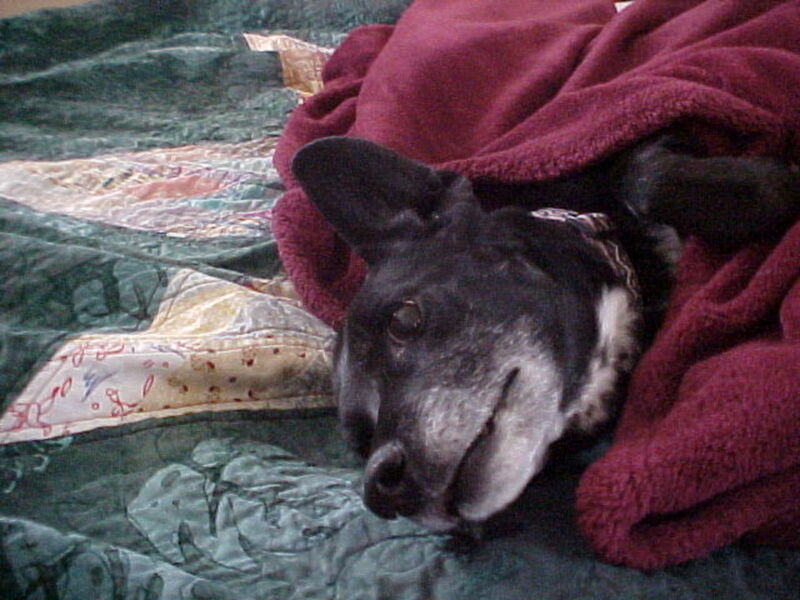 This used to be my burgundy fleece blanky, until my dog claimed it as her own years ago. Which is most of the time for our aging girl, unless we say the W-A-L-K word. This 30" x 40" Orthopedic Pet Bed is made with a warm plush top cover enclosing a 1 3/4" convoluted foam pad. The mat is easy to care for with a removable cover that is machine washable and dryer safe. Have a Great Dane? Well ... I'll have to keep looking then. This won't fit, I'm afraid. Sassy doesn't do PJs, but this sure is cute. And fleece on a train. And fleece for your car. Hey, if you prefer the shoulder next to you, or that feeling of cold glass up against your cheek, that's all well and good. But here's a soft, squooshy option for keeping your sleepy head in your seat. I never take off without one. This microfiber fleece inflatable neck pillow has a removable cover for easy washing. Sure, golfers need fleece too. After all, that vinyl golf cart seat can get kinda hot and sticky. So why not be comfortable while driving around, looking for your little white ball or waiting for your turn at the tee? Actually, these fleece covers are intended to extend the life of your seats and to protect against dirt, sun damage, and wear. The click-close straps allow for easy installation, and the water-resistant, non-slip fleece fabric won't shrink or stretch. This is a great bag for summer camping and would even come in handy on a cruise, for deck chair star-gazing. It's also a good sleeping bag liner for really cold-weather camping. This rectangular sleeping bag is constructed of brushed 100% polyester fleece. It's size is 29"X72" and two bags can zip together to double the size. This bag is ideal for home, summer camping, sporting events or travel. It's also machine washable. This fleece sleeping bag comes in four colors. Just a little to the left ... uh, a little higher ... oo, a smidge to the right ... ahhhhhh, that's it. If the night-time theme isn't your thing, this fleece-covered hot water bottle comes in a zebra print, as well as plaid, red, blue and green. This product holds in the heat longer than traditional rubber bottles, and the thermoplastic material is odorless and recyclable. 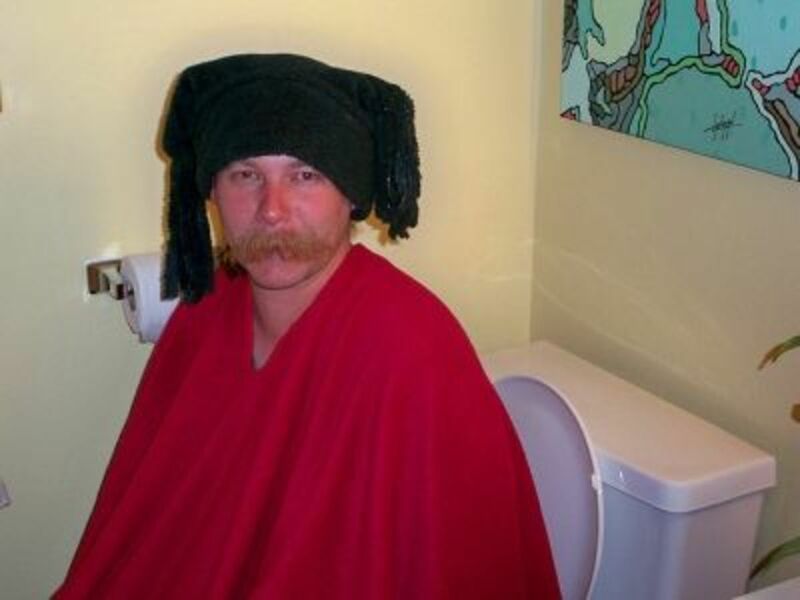 Check out the Cozy Comfort Fleece Toilet Seat Cover ad from Yoga Imports. Want a serape like this stylish red piece Steve is modelling? Well, you can have one just like it .... if you make it. All you have to do is get a big square of fleece, find the center and cut a slit in it, maybe stitch the edges on a sewing machine if you want to be fancy, and then stick your head through the hole. Oila! Fleeces are available in most local fabric stores, but if you can't find it there, Seattle Fabrics sells 17 different types of fleece material from their online store. Do You Have Some Fleece Around The House? - Add your comments below. Nice post. Great lens ! Steve is a super model! I laughed the whole way through the fleece fun! Funny thing, I had a SquidQuest on my dashboard that said, "...anyone who works as hard as you do deserves a little fun." Well, I stopped what I was doing and found fleece is fun! 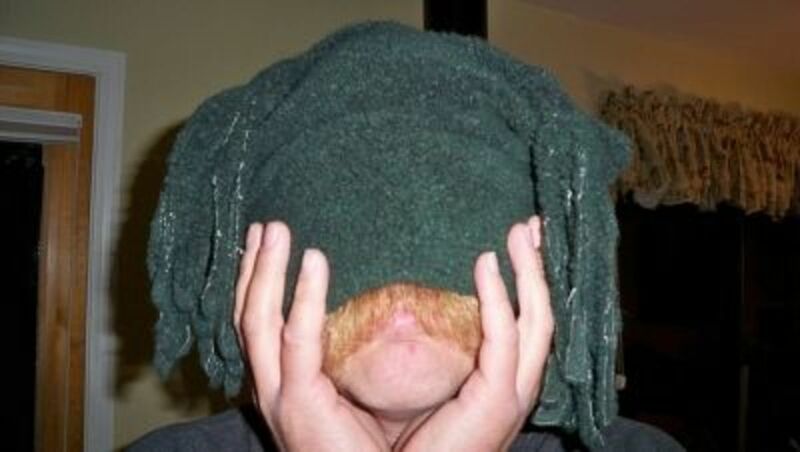 So your For The Love Of Fleece has been squidliked and submitted...smiles! Love the photos! What a great guy Steve is! Your model is tooooo funny! I love Fleece too and saw some Fleece on this page that I would like to own. A big thumbs up and congratulations on this well written lens. Actually, I am not a big fan of fleece, due to the static electricity (shocking! ), but I enjoyed reading your love letter to fleece. This dude makes me laugh. How funny, great lens... And well done Steve, love your work! I'm going to be laughing all day after reading this. I even had to show it to my hubby and his friends. I'll tell you one thing. I'll never look at fleece gloves again without thinking of Steve! Great lens. I have a few fleece blankets and gloves that I just love. I'm addicted to fleece. Blankets galore adorn my house. I can't pass them up when I see them. My dogs have their own fleece blankets all over the floor - they still steal mine. Heck, all my small animal cages have fleece instead of animal bedding! Love fleece pullovers and hoodies. Great lens! Also, Steve is a great sport! Thanks for the site which i bought this fleece warm up jacket and uniform outerwear jacket, i got it in a very low price. Jackets are made of high quality fabric, which is easy to care and use. they also offered me for a logo and embroidery personalization which is also available for less. Lots of cool things fleece here; lensrolled to air mattress and shower curtains for the home lenses. Funny, funky fleece - ably modeled by Steve the Good Sport (hey, isn't that what a spouse signs up for??). I love all my fleece - jackets, hats, scarves, mittens, loungewear and YES, BLANKETS! You gave me some ideas for holiday gifts I'm planning to make - can't go wrong with comfy fleece. What a fantastic lens. Love your sense of humor and the way you personalized everything. You're lucky to have such good sport around - kudos to Steve! Blessed by a Squidoo angel. Hey...I see you had a review by Seth and Megan! How cool! I can see lots of fleece lenses in your future! Love this lens and the pics!! I do agree...fleece is cozy warm! Actually, I have a fleece saddle pad (Merino) that I love; but I've gotta say that I have GOT to get some of those fleece socks (er not the booger picking ones, but regulars please :o) Congratulations on LOTD - very nicely done! Rolling laughing! Just sliding in here to say ~ Blessed by a Squid Angel~! What fun! I remember a week or so ago when you were tweeting about it being cold in the house. I guess you found the solution, huh? Great, great job! Very, very entertaining...that husband of yours is something else! The thing is, I think you encourage him. Or maybe you just bring out the best in him? In any case, it sure looks like you tow are having a lot of fun. I love fleece although I couldn't wear pajamas with feet. But I love the fleece pigtails hat and the fleece clogs. Here in Miami we don't need much fleece but I sure appreciate it when we go up to Vermont for the summer. I think you've covered it all and Steve is a real sport! Down at the beach, fleece is a one season item. Of course the mountains are just an hour away. I may have to get a set of those fleece footies for weekend fandangos. Oh your husband's a hoot! What a character :-) Great lens. This is a riot! Looks like you and Steve have a lot of fun together. I really enjoyed this lens! I love the pictures of your model, Deb!!! I do love my fleece too, and this is a real fun lens. Does Steve have a modeling agent yet? What a guy! Love this lens! 5* and blessed. Fleece is a wonderful thing, I see some items I would love to have here. 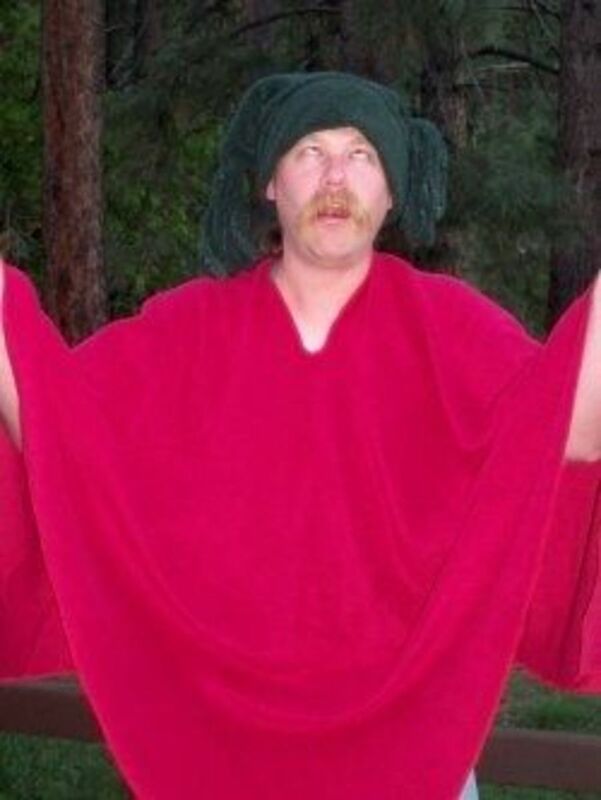 BTW, I think your hubby might be as goofy as mine. 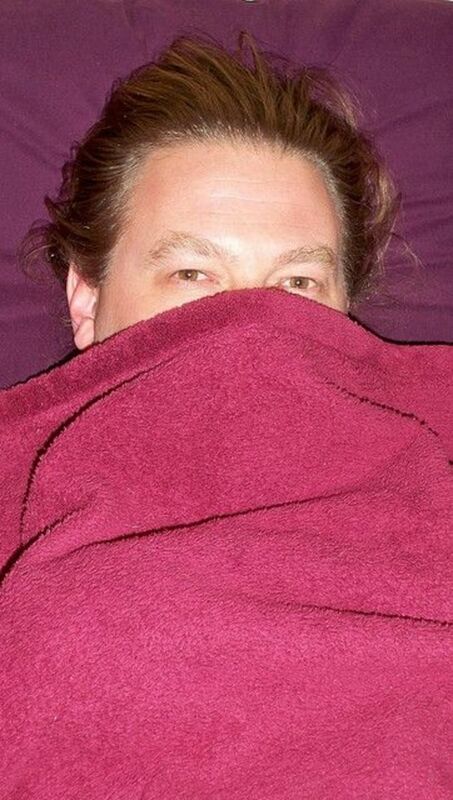 I love my fleece sheets, but I still use satin pillow cases that don't know my hair up overnight. I also wear lots of fleece sweaters &amp; jackets. Great lens! I do love fleece!! Your husband is such a good sport (and a bit of a ham)...haha..! Love fleece and had a good chuckle reading this funny lens. I once had a whole lot of fleece - well pure wool - clothing, but these last few years I've thrown it all out. They would have looked better on your model than on me anyway. I never realised fleece was so funny before. Great lens. LOL! What a fun lens. I have just a little fleece, I definitely need more.